This delightful sweets tower is a wonderful way to convey your best wishes for friends, colleagues and family. 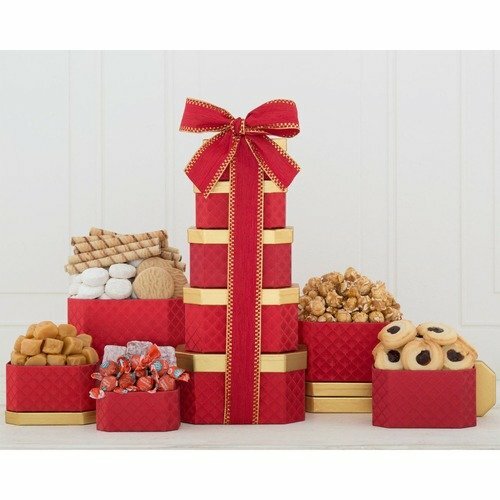 Each box is hand-pack with a different delicious treat. 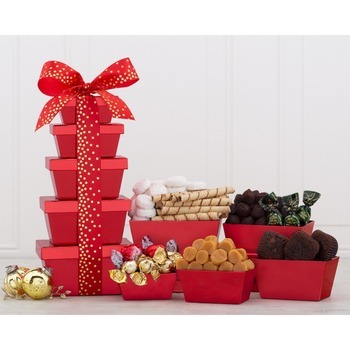 Assortment includes Walkers shortbread cookies, gourmet powdered almond tea cookies, Pirouline chocolate hazelnut wafer cookies, blueberry and almond fruit squares, blood orange and honey hard candy, Knott's raspberry shortbread cookies, vanilla caramels and caramel popcorn.